Somewhat taken aback, I had to admit to this “cafeteria queen” that I had a fondness for desserts, and making homemade desserts just happened to be one of her many gifts. From peanut butter pies to no-bake cookies, Darlene and her staff had a talent for creating tasty treats, and soon I realized she was right. No more packing my lunch, after 20 years. But Darlene, I soon discovered, was much more than just a manipulative manager determined to get her way. She and her staff took pride in not just providing food, but in presentation, in variety, in cleanliness, in service and most importantly…in love. 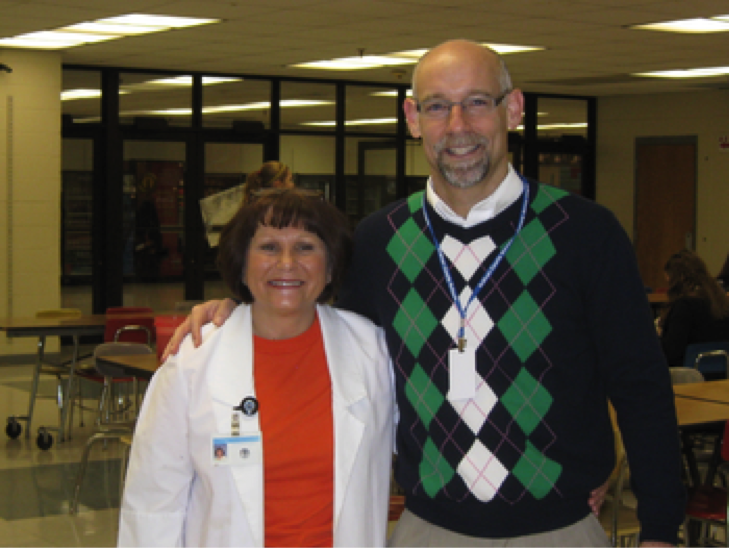 During my first week at South, Darlene and I had a conversation and the topoic turned to our families. She told me that she was one of nine kids and that her mother had died when she was very young, which led to her spending several of her formative years in a county home for children. But there was no bitterness and no invitation to a pity party in her story. Darlene also related a story that impacted her forever. Today, Darlene practices the principle of “pay it forward” and she regularly makes a difference in the lives of both the student body and the staff at Sullivan South. Darlene makes a difference in a multitude of ways: An extra portion there for someone who might look just a little bit hungry; a failure to charge someone for an item when that account is getting low; a special dessert for someone’s birthday. Or, if needed, she might just take a sterner approach, as she did with me. Recently, when told about a student who had not eaten anything in school for the entire first two weeks, Darlene was not just concerned for his health and well-being, she seemed personally affronted. How dare he not at least try her carefully prepared delicacies! She softened, however, when also told that the young man always ate alone, with no other student near him, and that he often put his head on the table and simply waited for the 30 minutes to pass. No food, no conversation, no joy. “Bring him to me,” she said, “when no one else is around. I want to talk to him.” The next day, the student was brought to Darlene, just prior to lunch. He got a personal tour, just like the one she given me. He also got a private, quiet talk. And he got a meal, for the first time, at Sullivan South. Our “cafeteria queen,” Darlene Carlton, may not have a television show like Paula Deen or ever be as well known as Betty Crocker. But she serves a lot more than just food at Sullivan South. She serves love and she dispenses an extra dollop, at no charge. She makes more than just appetizers, entrees and desserts. She makes a difference.